2019 CROSSFIT OPEN: SIGN UP NOW! It’s almost here! The Open kicks off in JUST OVER TWO WEEKS! For the experienced athlete, it is the time of the year that gets us giddy. For those new to this CrossFit thing, the Open is something you MUST know about and we urge you to consider trying! Last year we had almost 100 Covies participate in the Open, and this year we want to top that! What is the CrossFit Open anyway? Most of us, regardless of our CrossFit history, have heard of the CrossFit Games (or at least have seen some people doing CrossFit at a VERY high level on ESPN while channel flipping). The Open, simply put, is the early stage qualifying round that determines who gets to go to the Games. Given that most of us have no ambition of actually getting to the Games, the Open becomes a challenging and fun way to participate in a truly global CrossFit event. It is a way measure yourself against athletes around the world and hold yourself to a higher quality of movement by adhering to the CrossFit Games standards. We should also add that it is one of the most FUN things we do at the Cove all year long. This five-week, five-workout competition is held by affiliates and garage gyms around the world. Workouts are released online each Thursday, and athletes have until the following Monday to submit their scores. Anyone who’s at least 14 years old can sign up, and join in the first stage of the CrossFit Games season. Again, this isn’t about getting to the Games, it’s about getting better in general (and having fun while doing it). You fortify the bond even further with your fellow Covies. Like we said, this event is community at its finest! *Every 25′ of the walk counts as 1 rep.
Coach’s Tip: Tough metcon with the barbell being the focus. You should be aiming to do a set of 3 Power Cleans + 3 Front Squats + 3 Should-to-Overhead unbroken. A moment of chivalry from the 2018 Open at the Cove! 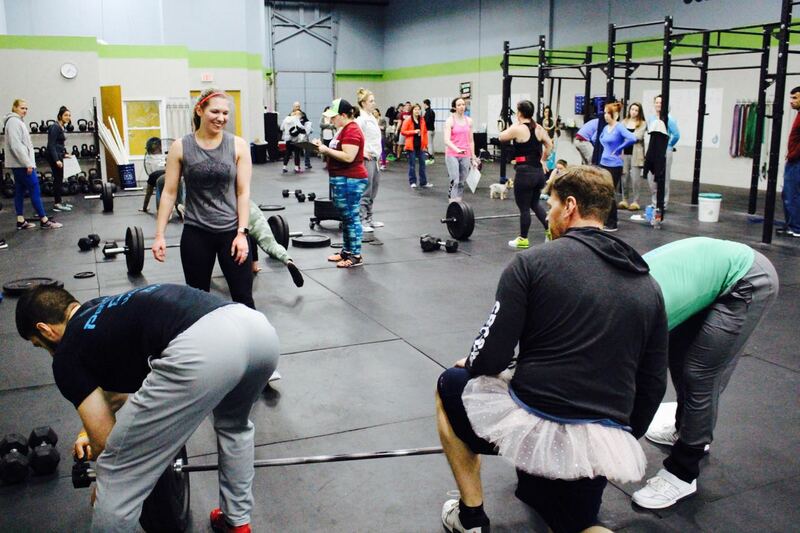 Ashley J. loved getting her barbell changed by three men (and one in a tutu). If this doesn’t inspire you to sign up, we don’t know what will!